Find out how McGeorge Brothers Chem-Dry makes your home a HEALTHIER home! Carpets, area rugs, and upholstered furniture act as giant filters that trap allergens and bacteria that, in turn, keep them out of the air we breathe. But, like air filters, carpets become full over time and need to be properly cleaned to remain effective. This filtration is especially important for the 1 in 5 Americans (roughly 60 million) who live with allergies or asthma. You can ensure healthier indoor air by keeping your carpets clean through regular vacuuming and professional carpet, rug and upholstery cleaning every 6 months. This is what will help rid your home of common allergens and bacteria that settle deep in your furniture and carpet. McGeorge Brothers Chem-Dry is committed to providing you with superior solutions and services that you can trust to keep your home clean, safe and healthy. Using a green-certified solution and our Hot Carbonating Extraction cleaning method, we deliver a deeper, longer lasting clean that leaves you with peace of mind and a healthier environment for your family. Chem-Dry’s mission is to help people live healthier lives. To find out if we can provide the clean and healthy home results you want, we had independent laboratories test our core cleaning methods. 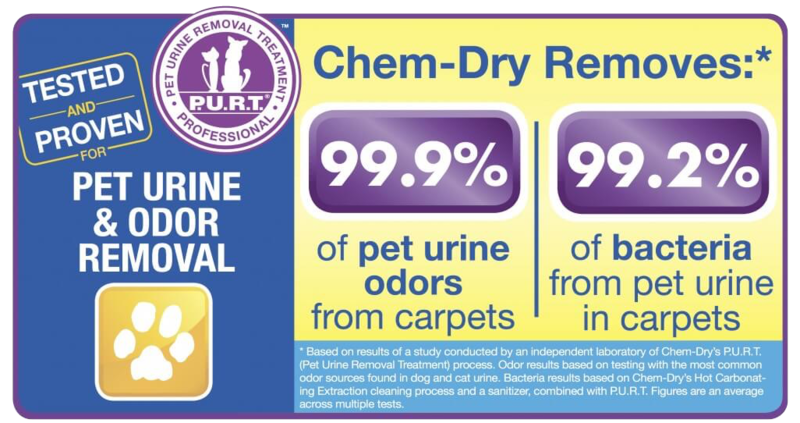 They tested Chem-Dry against some of the most common unhealthy elements found in homes – allergens and bacteria. We’re happy to share those results with you! Chem-Dry’s Hot Carbonating Extraction (HCE) process was tested by a leading independent air quality laboratory in multiple homes. 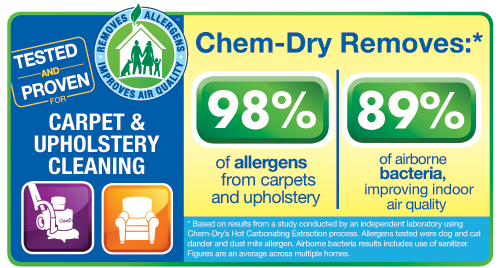 The lab concluded that Chem-Dry removes an average of 98.1% of common household allergens from carpets and upholstery. The common allergens tested were dog and cat dander and dust mite allergens. Additionally, our HCE process, when coupled with a sanitizer, was found to remove an average of 89% of airborne bacteria and 82.3% of the bacteria in carpets. Indoor air quality is a significant home health concern because the average home can harbor as much as 200,000 bacteria for every square inch of carpet. As bacteria builds up, the bacteria lurking in your carpets get disrupted and circulate in the air your family is breathing. That is unless you properly clean them. Carpet cleaning with McGeorge Brothers Chem-Dry is not only effective at removing the bacteria from the carpets, upholstery and other surfaces, but we also improve the overall air quality in your home. Considering that the average person spends an average of 90% of their time indoors, it is crucial to select a trusted professional cleaning service. McGeorge Brothers Chem-Dry practices safe and healthy processes to clean your carpet, upholstery, and area rugs. All of that helps play a major role in the health of your home and your family. At McGeorge Brothers Chem-Dry, we want you to breathe easier and not worry about the healthfulness of your home’s environment. Our carpet cleaning method can help you remove the allergens and bacteria hiding in your home and improve your indoor air quality. Call us today to ensure a safe and healthy home environment for you & your family because we care about your health.